Our next project is to knit or crochet baby blankets for Project Linus, which provides blankets to critically ill children. We will meet on March 19, April 16, and May 21 from 10am-2pm to work on the blankets. You don’t have to come to every session, or stay for the whole time! Come for all or part, or just work on this at home. Size can flexible. Small would be about 36” by 36”, most are 40” by 60”. Blankets must be handmade and washable. Blankets should be made & stored in a smoke-free environment, and be free from animal hair and chemical contaminants. The blankets should be free of buttons or other possible choking hazards. Blankets are due at the last session (May 21) but can be dropped off any time. If you don’t have time to work on a whole blanket, you can come to work on a worsted weight crochet granny square or a knitted mitered square. You can use any washable yarn scraps in worsted weight. Please meet the overall size for the patterns. The knitted mitered square is “Mitered Squares” by Very Pink. The crochet granny square pattern is “Circle in a Square Block” by GourmetCrochet.com by Carolyn Christmas. These patterns are free on Ravelry. 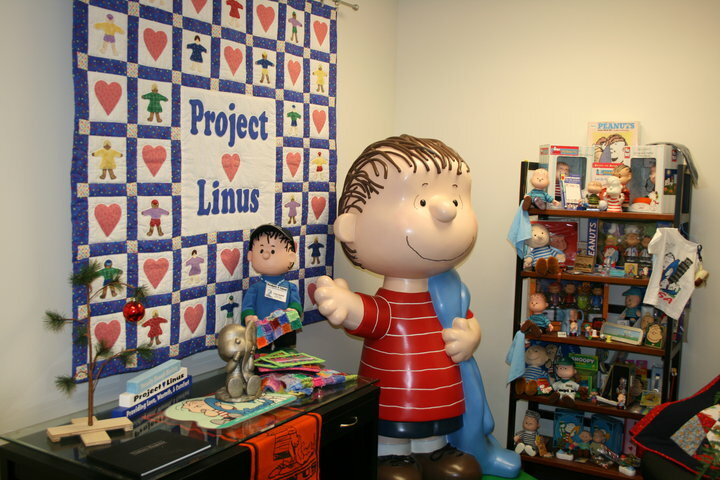 Project Linus donates blankets to children, infants through teens. Many sizes are appropriate depending on chapter need. For example, blankets could be as small as 36″ × 36.” The majority of Project Linus blankets are about 40″ × 60″, or what is called “crib size.” Blankets could be as large as twin size for teens.